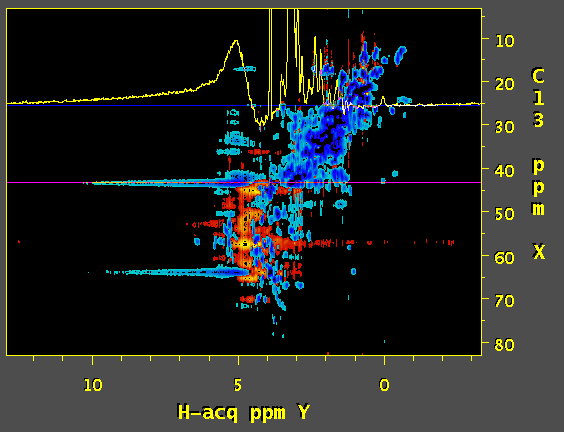 Hi, we've tried to apply SOL function of nmrPipe to process a 3D 13C edited NOESY. 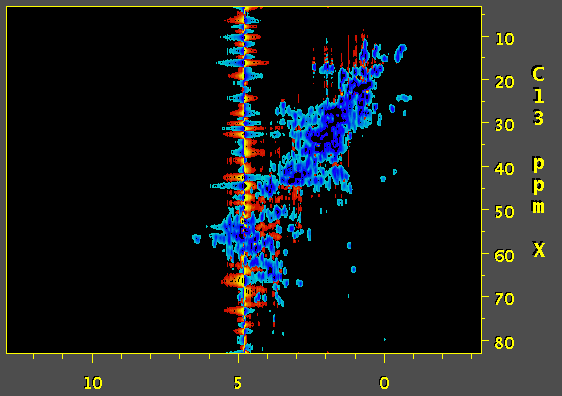 and the result is a wide antiphase-looking peak on water resonance that strongly distorts the baseline. Would you have any idea what might be causing this? First image is a screenshot of data using SOL processing step and the second one was prepared without SOL. Did you try to use "POLY -time" for solvent supression? For me this works better most of the time. Based on the documentation of NMRpipe it appears that the SOL function calculates the average over the chosen window and subtracts it out from the current datapoint. The length of the window can have a dramatic effect on the quality of the solvent suppression. Based on this, and a quick look at the NMRpipe documentation, I would expect that a substantial improvement of solvent suppression can be obtained by using a lower the value of flenpts parameter associated with the SOL function. In addition, I would expect that changing the fshape parameter to select for sinusoidal weighting (instead of the default boxcar) would be helpful. The mirror option of the SOL function may also be useful. Decrease the window size for the first few data points, keeping the chosen value of flenpts for the remaining data points. Predict values of the fid for negative time points by using extrapolation or by using a mirror image of the fid; then use these values for calculating the required averages over a window of fixed length. Apparently, extrapolation is the default for NMRpipe. The solvent peak, in general, has a large magnitude; hence, small inaccuracies in the extrapolation can give rise to the observed baseline distortion. Therefore, better results may be obtained by using a more efficient method for estimation of the data values for negative time points. Note: I have never used NMRpipe (I used Felix and data processing software written by myself).